When you go out for a bottle of wood glue and come home with three cans of spray paint, primer, a paper palette, sandpaper, and enough blue painter’s tape to mask the Taj Mahal, don’t be surprised when you begin to see everything you own in a different light (or color). I’m not completely without a craft bone in my body. Our vacations are painstakingly recreated in a big scrapbook, and I’ve been known to decorate birthday packages with twine, stickers and flowers. I got it into my head when I was doing my normal spring inventory of garden supplies. A few pots would have to go and I was picturing what flowers and vegetables I would buy (I had just bought a new patio planter I couldn’t wait to fill with vegetables). I picked up my weather-eaten wooden pot holder to get to another pot and I was left holding a beam. The gray wood piece felt rough in my hand and it drew my attention to the real state of my small patio. In the corner sat a worn, matte metal flower pot holder. Faded with age and showing small bits of red-orange rust, it didn’t look as bright and young as when my brother gave it to me eight years ago. Three tiered stands cost nearly $60 (no small change), and this one had traveled with us on multiple apartment moves. Definitely a keeper. Next to it sat a very rusty pot stand and a bit behind that a tiny metal bench that used to prop up two cozy garden frogs from my grandmother (now broken and long gone). It was easy to ditch the plastic pots (my mother wanted most of them), but the other bits and bobs held more meaning and whimsy. I wanted a way to preserve them. So I decided to start with the wooden pot holder and went out for glue and “to have a look around”. Little did I know that I would have to decide between what seemed like 50 shades of grey (ok, bad pun!). 😯 The wall of spray paint in Home Depot spread out before me with mysterious brands, even more mysterious names (what exactly was “hammered” when it wasn’t connected to alcohol? ), and endless shades. 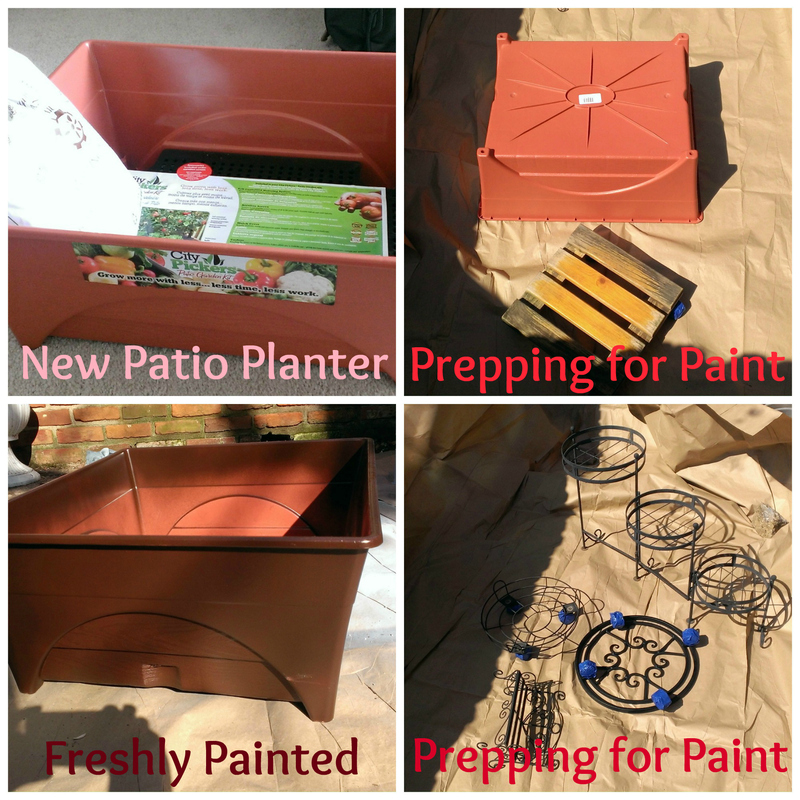 My eye spied the lovely named shade of “satin espresso” (or less romantic matte brown), that I thought would look wonderful over my old, wood stand and new patio planter, and I submersed myself fully into the Spring breeze by picking out a “peekaboo blue” shade for the large stand. After channeling my inner Vila and picking up a few other (what I imagined to be important) supplies, I carted my load back home and began prepping. 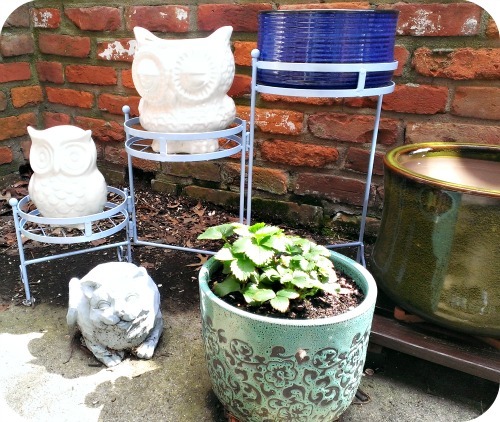 Newly painted “peekaboo blue” stand with my owls and pots and the “satin espresso” wood stand now holds my new dark green pot. Being crafty isn’t really my thing – generally I’m in the “throw it out and buy a new one” camp, but this time I decided to give it a go. I’m glad I did! Not only was it easy and fast, but it was a lot of fun to watch something that looked neglected “smile” again with its bright new coat. 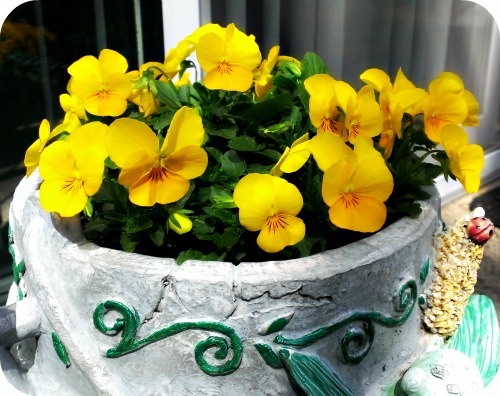 Categories: Garden, Musings | Tags: craft, gardening, Musings, paint, Summer | Permalink.